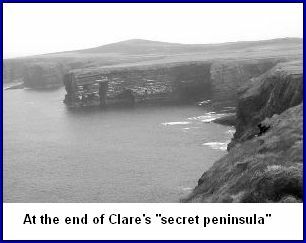 Loop Head is one of Clare’s lesser known hideaways. Lying about two hours by car from Shannon airport (via Ennis and Kilkee), it features a breathtaking coastline, with ranges of sea stacks rising up 80 metres from the sea in places, in what seems like an unending battle between the land and the raging Atlantic. I’m told that some nutters actually climb the rocks here—the thought of it makes me dizzy. The far end of Loop Head peninsula is a strikingly remote spot, with a distinct “edge of the world" feel to it. A whitewashed lighthouse stands at the tip of the head, but there are no shops, no signposts—nothing but birds, wild flowers and the surf pounding against the cliffs. On a recent visit, I must admit I had a Tippi Hedren moment walking along the spongy grass to the sound of thousands of shrieking gulls. But sitting down to a picnic was wonderful with the waves roaring below. As it was April, the area was quiet. Just a few other visitors strolled by now and then. If you’re the type who revels in this kind of isolation, you’ll be glad to know that the Loop Head lightkeeper’s three-bedroom cottage (right next to the lighthouse) is available to rent. The accommodation is absolutely traditional: the place has no telephone, television or microwave. The closest amenities are three miles away in the town of Kilbaha, which has a post office, shop and a pub (you can also hire boats there). The cottage can be rented from The Irish Landmark Trust, for a weekend rates of 363 Euro in “mid season" (June & September) or a 7-night rate of 770 Euro in July and August (no weekend rental is available in summer). Call 011 353 1 670 4733. After our picnic at this delightful spot, we continued on to the village of Carrigaholt (which means “Rock of the Fleet"), an historic fishing port, on a fine bay at the mouth of the Shannon. Carrigaholt is an attractive little town, where a good deal of Irish is spoken. The airport at the other end of the river seems far away here. The town’s most dominating landmark is its “tower house" style castle on the waterfront. Built around the end of the fifteenth century by the MacMahons, chiefs of the area, its ivied battlements are impressive. The castle has five storeys with a vault on the fourth floor and common features of the time like a “murder hole," a room just inside the entrance where owners could attack intruders from balconies above. A small shingle beach here is pleasant enough for sunbathing or swimming (there are better ones in in nearby Doolin or Kilkee). But what really draws the people to Carrigaholt is dolphin and whale watching. The Shannon estuary is the longest sheltered, naturally deep estuary in the country, and is a playground for bottlenose dolphins. A group of over 100 of them live in the estuary between the Loop Head and Kerry Head peninsulas. The Dolphin Watch company offers 2- hour boat trips daily, where you can learn about the dolphins, sea birds and local features (call 011 353 65 9058156 or visit www.dolphinwatch.ie). The town has great pubs and eateries, and not too many tourists. My choice of pub would be the Long Dock on West Street, with its stone walls, flagstone floors and warm fires, all of which provide a cozy atmosphere. There’s a great selection of seafood – the Long Dock has received the “Pub Lunch Award" from the Irish Fisheries Board. It also has regular traditional music sessions around 10 pm, though I didn’t stick around long enough to enjoy one on this particular trip. As in most parts of Clare, accommodations are easy to find and reasonably priced. If dolphin watching is not your thing, you might consider fishing. The Glencarrig B & B and Sea-Angling Centre is an ideal place to fish and stay (in fact, they have a website called www.fishandstay.com). This big old house on the beach is located 1½ miles south-west of the village on the Loop Head Drive, and can handle parties of up to 7 fishermen at a time. Owners Luke and Mary Aston are delightful hosts (call 011 353 65 9058209). Loop Head, as striking as it is, is just one more of County Clare’s amazing landscapes. What always strikes me driving around here is the sheer diversity of scenery packed into a small area. From the limestone flats of the Burren to the boggy landscape near Kilrush and sculpted cliffs and sandy beaches along the coast, Clare never gets monotonous.